17/02/2017 - The SCREEN simulation framework code has just been released under the general public license, at the GitHub repositories. The code can be found in the link below. 03/02/2017 - Testing of the SCREEN cognitive radio solution has been successful. Tests were carried out in the Microwave and Optical Communications Laboratory at INESC TEC in Porto, by a team from Tekever and INESC TEC. Test results have shown the capability of fast adaptation of the GAMALINK platform, demonstrating the capability of automatically avoiding interference with spectrally overlapping signals, and preserving primary user signals. 25/11/2016 - The SCREEN ns-3 based simulator has been used to evaluate the performance of cognitive algorithms. The most recent results can be found here. 18/11/2016 - INESC TEC welcomed the SCREEN consortium for a technical meeting in Porto. The meeting was focused on technical presentations of recent project results as well as the definition of the final steps towards the end of the project. 23/08/2016 - In support of the H2020 SCREEN project the Avanti team went to its UK satellite gateway antenna site located in the historical Goonhilly Earth Station. Measurements were performed using a high quality 1.2m tracking antenna. These measurements included wideband spectrum use and satellite downlink transmissions in their original modulated state to provide real-life data samples. This data will be used in support of the detailed tests of the cognitive radio algorithms to be done in laboratory by other project partners. Recordings for three different satellites were made. 18/07/2016 - The ns-3 based simulator is now fully operational. The simulator allows for the evaluation of multiple scenarios and for the seamless inclusion of new cognitive algorithms. More details can be found here. 15/06/2016 - The SCREEN consortium was pleased to welcome Dr. Arnd Weber from the Karlsruhe Institut of Technology (KIT) to join the SCREEN project meeting in Bremen. Dr. Weber is an renowned expert in the area of innovation processes and impacts of technology. The project team had a very interesting exchange of ideas with Mr. Weber regarding the current project results and how to disseminate and exploit project results." 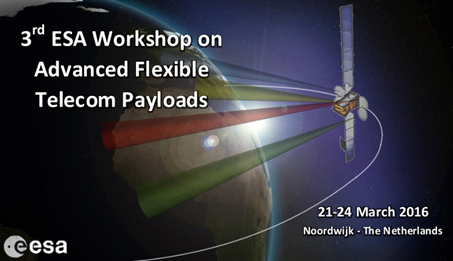 24/03/2016 - Pedro Rodrigues from Tekever presented the paper entitled "A Chameleonic Approach to Space Communications", at the 3rd ESA Workshop on Advanced Flexible Telecom Payloads, that was held between 21 and 24 of March 2016 at ESA/ESTEC, Noordwijk, The Netherlands. This conference provided wide visibility to the SCREEN project, since it involved many Satcom stakeholders, from operators and industry to research institutes and universities. The presentation can be found in the publications section. 15/01/2016 - The first simulation results have been obtained using ns-3 simuation and visualization in Google Earth. A new ns-3 mobility model for earth orbiting satellites has been created which is based on the SGP4/SDP4 models developed by NORAD to predict near-space/deep-space satellite orbits. 28/10/2015 - Pedro Rodrigues from Tekever participated in the National Space Infoday, in Lisbon. Bilateral meetings with EU representatives were held with the aim to discuss SCREEN follow-up ideias. 27/10/2015 - Following the presentation and publication of the SCREEN paper in the IAC 2015, the Consortium has been approached by the European Space Agency eoPortal to iterate a SCREEN technical description to be uploaded into the portal. This will provide great visibility of the SCREEN project within ESA and the global Space community. 12/10/2015 - Luís Pessoa from INESC presented the paper entitled "Cognitive Radio for SatCom Applications: The Screen Project" at the 66th International Astronautical Congress that was held between 12 and 16 of October 2015 in Jerusalem, Israel. 8/10/2015 - MIG represented SCREEN in a meeting held in Germany with the DLR (DeutscheLuft- und Raumfahrtzentrum - German Aerospace Center) in order to present the SCREEN project and gain support to join the regulatory board. Mr. Dr. Ralf Ewald is responsible for the regulatory topics at DLR and also part of the German delegation to the ITU. Dr. Ewald was very interested to hear about the Screen projects and provided very valuable feedback. Furthermore he has agreed to join our advisory board. 11/09/2015 - More than technical discussions, this meeting also included a dedicated standardization and regulation session with the presence of Paulo Marques, from IT Aveiro in Portugal, who is leading the CRS-i coordination and support activity for Cognitive Radio standardisation. 03/06/2015 - MIG will hold a presentation on "The SCREEN project - Cognitive Radio in Space" at SpaceUp GLIC Munich, the kick-off conference for the Global Space Innovation Conference - GLIC 2015 in Munich, which is co-organized by the International Astronautical Federation (IAF), the German Aerospace Center (DLR), the European Space Agency (ESA) and the Bavarian Ministry of Economic Affairs and Media, Energy and Technology. We encourage everybody interested in #Space and #CognitiveRadio to join us on June 23 at the Residenz Palace in the heart of Munich, next to the famous Hofgarten and vis-à-vis to MIG premises. 24/04/2015 - The SCREEN project has its first abstract accepted for publication at the 66th International Astronautical Congress to be held from 12-16 October 2015 in Jerusalem, Israel. The abstract is entitled "Cognitive Radio for SatCom Applications: The Screen Project”, and has been selected for oral presentation. 19/02/2015 - The SCREEN Kick-Off meeting took place at Tekever premises in Lisbon, on the 3rd of February 2015. There were presentations from each partner introducing them to the consortium. A detailed analysis of tasks within WP1, WP2 and WP6 was also carried out, and next steps were agreed. The next meeting is planned for the first week of June, at AVA office in London.